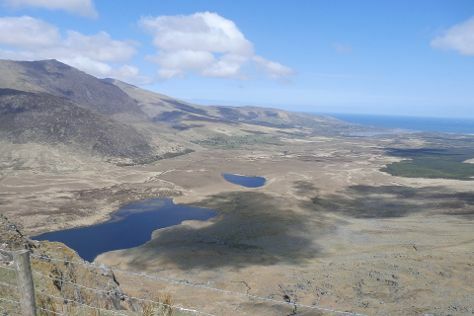 Splashed by the crisp waters of the Atlantic and famed for its rugged natural scenery, the Dingle Peninsula features some of Ireland's highest mountains. Home to a large Irish-speaking population, the peninsula maintains its unhurried pace of life and a strong tradition of poetry, music, and storytelling. A place of many faces, the Dingle Peninsula boasts varied landscapes that include rocky hills, sandy beaches, ancient ruins, and staggering cliffs. To meet the locals and hear them tell stories in their native tongue, explore the small villages and their cozy pubs. Save time and avoid confusion on the road by purchasing a map of the peninsula, which provides both Irish and English versions of all place names. Dingle Peninsula is in County Kerry. Plan my day in Ireland using traveler tips and tourist information provided by Inspirock. Most people choose to see the breathtaking Dingle Peninsula by staying in Dingle Town, where affordable bed and breakfasts are a staple. The laid-back city also sports a number of hotels, hostels, and even pubs that offer accommodations in or near the town's center. If you want a more lavish vacation spot, splurge on a luxurious guesthouse with views of Dingle Bay, which you'll find both in town and outside of it. Stay in Dingle Town to discover the city and its surroundings on foot, or use it as a base for exploring the rest of the peninsula via coastal drives.